Hello, friends! Oh, how I have missed you all. And I have missed writing my stories, but you know the drill… December is a big, fat, hairy beast. And it defeats me every single year. It is my white whale (Call me Five Baby Mama). I did my best to make our holidays uncomplicated, yet memorable. Full of quality family time, but not so much that we feel the need to move to a deserted island with no forwarding address afterwards. I did the planning and decorating and shopping and wrapping and delivering in small increments all month long so I wouldn’t be stuck down in the basement at 2AM on December 24th with nothing but scotch tape holding my eyelids open while I tried to assemble some crazy plastic contraption with more parts than there are letters in the Chinese alphabet. But December still got the best of me. The kids started getting sick back at Thanksgiving. I have hand-outs from our pediatrician with the following titles… the stomach flu, croup, infectious mononucleosis, and pneumonia. Fortunately, there was no cross-contamination and everyone got their own special disease. Trust me, that did not happen by accident! And they were all sick at different times, so the “sickiness” seemed to last forever. A big shout-out to Kid B for staying healthy! Then came December 14th and my heart broke so hard and loud that I felt it on the outside of my body. I don’t normally watch the news because it feeds my anxieties in a very unhealthy way, but no one could escape the horror story. My tears did not stop falling. They still haven’t. Then came Christmas Eve and our new family tradition of Chick-Fil-A and peppermint milkshakes, and our old traditions of Sheepdog re-telling the story of Jesus’ birth and me reading ‘Twas the Night Before Christmas and putting out a note and cookies for Santa. Our Christmas morning was full of smiles and hugs and Skype and wrapping paper and joyful noises. We are very, very, very blessed. 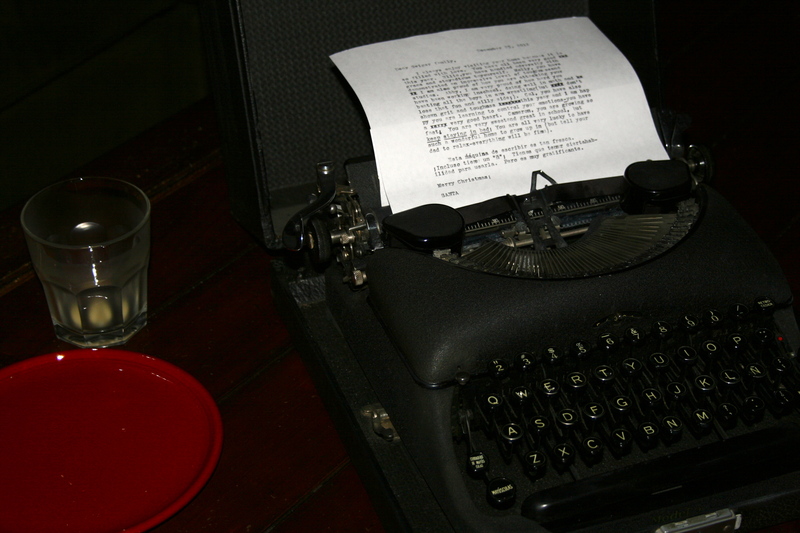 Kid A asked Santa for a vintage typewriter for Christmas. The Big Guy delivered an awesome one with keys en Espanol. Click, Clack, Moo (egg nog). Then, since I couldn’t manage to get out of it, we had Christmas dinner for thirty people at our house. No, I’m not kidding. We had to find thirty places for thirty heineys to sit and eat. And we managed to pull it off! So on the night of December 25th, Sue, Tom, Bonnie, Joe, Tooker, Josh, Stacy, Ellie, Braden, Molly, Abby, Cal, Cam, Keri, Charlie, Foster, Luke, Nora, Rob, Kelli, Wilson, Phoebe, Mallory, Quincy, Brandon, Becky, Brady, Cooper and Eden all listened (most without giggling, although Brandon always fails at this) as Reverend Bob gave the blessing. Then we sat down and ate together and laughed and shared stories and memories and made some new ones too. And speaking of holiday memories… one of my biggest projects this December came in the form of a request from my dad. Many, many years ago, back when dinosaurs roamed the Earth, he fell deeply in love with a girl named Sue Speed. He loved her so much that he asked her to marry him when they were just nineteen years old. And being a dumb boy, he did it in a fairly unplanned, unromantic way… in the backseat of a car, with his pregnant teenage sister and her baby daddy up front driving. In the middle of the Cardiff Circle. Luckily, Sue Speed loved him back so much that she said YES anyway, and they have been together ever since. But my dad has always regretted not having proposed with more style (partly because my mom tells him he should). So, this Christmas he had my cousin Ashley design my mom a fabulous new ring, with both old stones and new ones too, and he asked for his daughters’ help in planning a new and improved proposal that would knock her socks off. And we did it. We gathered together as many old (and some new) pictures of our family’s Christmas memories and I put together a DVD that showed them off and then featured our Top 10, with Number 1 being the lame proposal (which we so fabulously re-created using Rob and Kelli as “Uncle Bobby” and “Aunt Janice”), and at the end my dad turned to the camera and asked for a re-do. We played the DVD on Christmas Day when all thirty of us were gathered together and at the end my dad walked over to my mom and re-proposed. He got down on one knee and talked about everlasting love and still getting excited to see her when he was driving home from work every day and it was sweet and romantic and my mom thought he was nuts. Luckily, she still loves him back so much that she accepted once again. The holidays can mean different things to different people. To the young child it may mean that their parents will dress them up and drag them all around town, and if they have been a good little boy or girl this year they might have a Hot Wheels wall track or a pink LeapPad Explorer waiting for them under the tree on Christmas morning, Santa willing. Hey Santa! 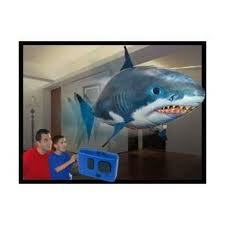 This is number one on my wish list... an inflatable remote control flying shark. Awesome, right? To the young couple it means spending lots of time with each other’s relatives, usually with excess stress and excess food and excess alcohol, all the while making whispered promises to each other that their lives will never, ever resemble those with whom they share those inextricable genetic links. To the parents of teenagers it may mean being able to enjoy the Christmas Eve church service without (as much) fear that it might be their child who drops the taper candle during the congregation’s rendition of “Silent Night,” thus setting a pew or a hymnal or an old lady’s wig on fire. To the grandparents it may mean a renewed spirit, and seemingly new eyes through which they get to watch the next generation experience the innocence and unguarded joy of believing in flying animals and toy workshops and true, untainted Christmas magic. I have been running around for the past month like a crazed (yes, even more than usual) lunatic, slowly but surely crossing things off my To-Do lists, which were constantly being extended and amended and created anew. I have been planning and shopping and wrapping and baking and decorating. Sheepdog has been traveling for work all month, right up until he flew home from California on the 22nd. The kids have all participated in their classroom parties and team celebrations and gift exchanges. Then yesterday the seven of us piled into the car and drove well over five hundred miles to be with Grandma and Grandpa in West Virginia. We are all still swirling around, caught up in the glorious enchantment that reaches its pinnacle tomorrow morning. This afternoon we will finally slow down as we come together to spend time with even more family. Tonight we will watch a reenactment of the birth of Jesus at a family friendly church service in town. Finally, when the kids are just about to burst with anticipation, Sheepdog will read ‘Twas the Night Before Christmas and everyone will eventually fall into bed. In theory, Christmas is supposed to be about simplicity. It is about Jesus being born in a stable. You don’t get much more unelaborate than that. In reality, Christmas is complicated and stressful and expensive and anxiety-ridden, especially in the weeks and days leading up to it. But, if you are really lucky, you will also get to experience those moments of calm and peace and love and true magic that make Christmas such a wonderful time of the year. Here’s to you and yours. May your weekend be filled with the people and things that make you happy, even amidst the crazy. Make sure that you take the time to stop and smell the Christmas cookies. Joy to the World!